Some neat pictures of an old corner car lot, new and used. Photo Picture Classic Cars for sale & Classifieds - Buy Sell Classic Car & Classic Truck Classifieds. Car Photos > Memory Lane - a trip through the iconic years > Some neat pictures of an old corner car lot, new and used. Some neat pictures of an old corner car lot, new and used. 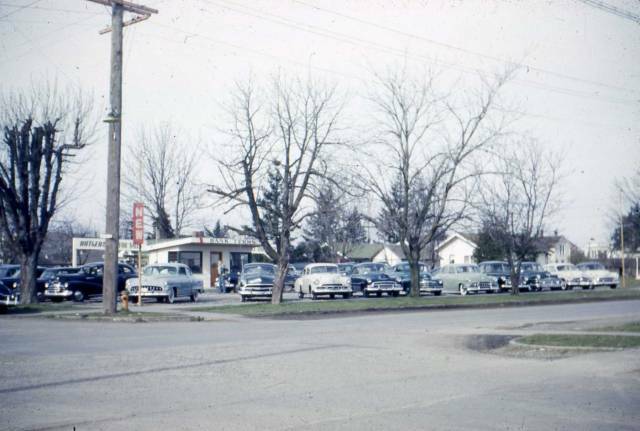 Old photos of an early corner car lot in Lynden, Washington, most likely mid 50's. my grand father bought a 45'chevy for 50 bucks when it was only like 5 years old.you cant find a car that cheap nowadays. HEY FELLAS, LOOK AT THE GUY WITH HIS HANDS ON HIS HIPS. ALSO, IS THAT ONE ON A RACK IN BACK? is it possible to travel back in time?? This type of activity was accepted before zoning stop all parking on front lawns. nice photos, i wander if the guy that took the photos was actually buying one of them. Like going back in time.....awesome. Great old car lot photos!